Architectural Antiques conducted this salvage of the Chapel of the Angels which was hidden on the top floor of St Joseph’s Children’s Home in Superior, Wisconsin. Designed by Cleveland architect, Emile M. Ulrich, the orphanage was completed in 1917. The chapel, a gift from the Bishop of the Diocese of Superior, was not completed until 1919. The children's home operated until 1963 when foster home programs eliminated the need for such a facility. After that, it was used for other social programs (refugees, day care and handicapped center) up until 1984. Changing needs and the inability to find new uses for a building are the first steps toward its demise. St. Joseph's stood empty for over a decade when a decision was made to gut the building for remodeling. While the rest of the building was not as significant and had been substantially changed over the years, the complete destruction of the virtually unchanged, two-story chapel would have been a great loss. While the orphanage itself was Neoclassical in style, the exception was this chapel, truly this was a chapel of and for the Angels. Artisans from Italy and Czechoslovakia crafted many of the stained glass windows. Italian marble, ornate plaster work, gilding, carved oak pews (undersized for children), and statuary made up much of the chapel's interior. Salvage efforts by Architectural Antiques successfully removed a majority of all items that could be reused. The firm attempted as complete a salvage as possible, spending numerous man-hours on scaffolding painstakingly removing the ornamental plaster work, much of it covered in gold leaf, from the walls and ceiling. 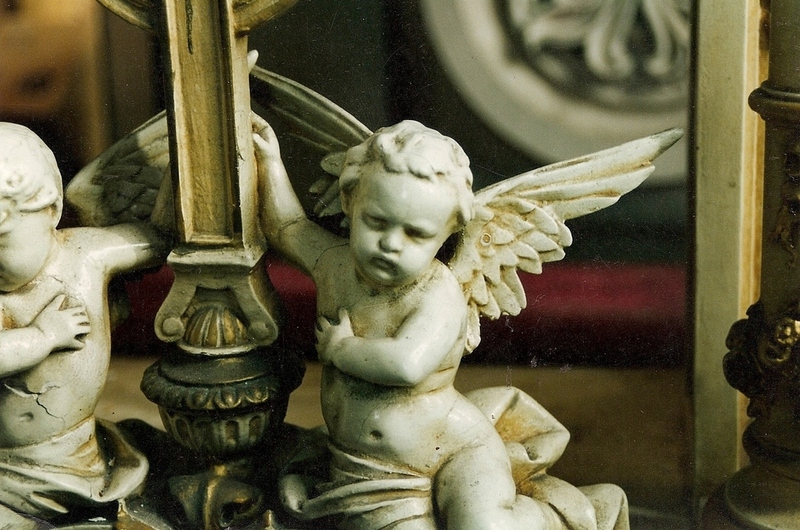 Much of the plaster work, light fixtures, paintings & bishop chairs featured cherubs & angels, a consistent theme throughout the chapel. Those pieces as well as marble alters, stained glass and the oak pews were all saved and have been integrated into other homes or offices.